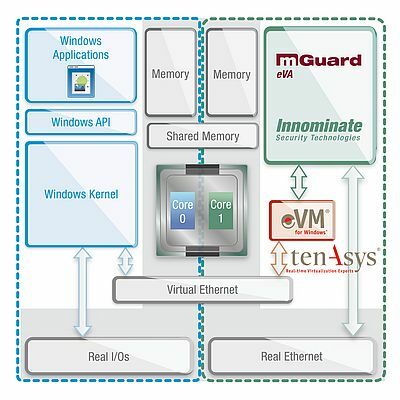 Innominate launches its product mGuard eVA on TenAsys eVM for Windows. It is an easy to install, embedded virtual security appliance for networked PCs. With mGuard eVA, Windows systems and applications can be hardened and protected by a firewall, shielded from denial-of-service attacks, have their integrity monitored, and securely receive remote maintenance services through VPNs via the Internet, all in a very cost-effective way. mGuard eVA comprises and uses the newest version of the TenAsys eVM for Windows embedded Virtualization Manager to integrate with native Windows systems on multi-core PCs. It thus represents the first software product to easily implement Innominate’s repeatedly demonstrated HyperSecured concept of embedded systems protection by virtual security appliances with a simple out-of-the-box setup. Installation of mGuard eVA requires a 32 or 64 bit Windows system (XP or newer) on a multi-core PC platform with 2 or more cores, Intel Gigabit Ethernet interface as well as VT-x and VT-d virtualization support (other configurations on request).